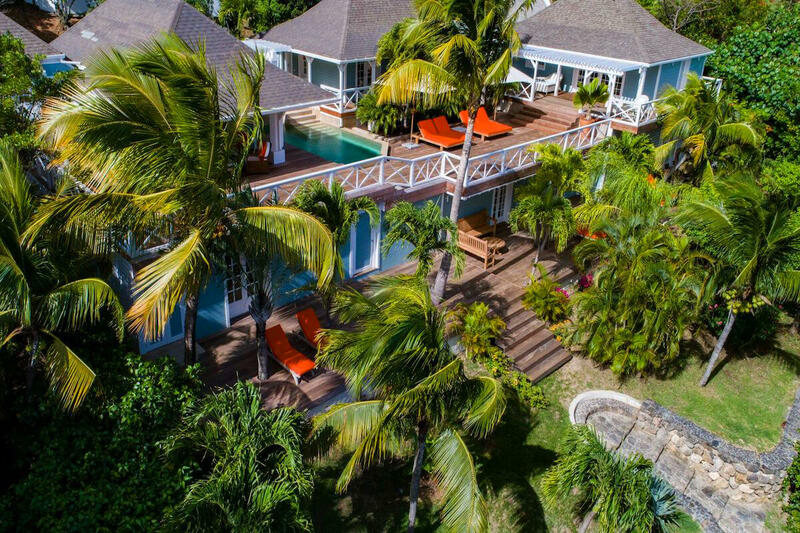 La Case Créole is a great family vacation villa. It has six bedrooms spread across two levels, and every suite has its own bathroom and patio. The home feels like a tropical oasis, but its only a short drive from two of St. Bart’s prettiest beaches. If you’d rather stay home, there’s plenty of space to sunbathe and relax outside at the villa. La Case Créole is a luxury villa formerly known as Villa Cricket. It’s eclectic decor combines Shaker-style four-poster beds, stainless steel appliances, and Caribbean rattan furnishings. This vacation home’s terrace is spread over two levels, and all three buildings flank the balcony pool. The terrace is set up with sun beds, a shaded dining table, and manicured foliage. The balcony is ideal for poolside lounging, family dinners, or evening cocktails. A turquoise pool stretches across the center and vibrant sun beds with umbrellas sit to the side. On clear days, there’s an ocean view that stretches to St. Kitts. The gourmet kitchen has a large center island with barstools, a coffeemaker, and stainless steel appliances. It connects to a dining area that seats six and a living area with large sectionals, an entertainment system, and a wall of sliding glass doors bordering the balcony. The master suite’s French doors open to a lounging balcony with a hammock. The suite is furnished with a desk, a flatscreen TV, and an ensuite bathroom with exterior access. There are two more king suites that also have exterior access, flatscreen TVs, and ensuite bathrooms. On the lower level there are two large bedrooms with flatscreen TVs, ensuite bathrooms, and private terraces. One of the lower level suites has a small connecting bedroom with a twin. All five suites have a king bed and views. Daily housekeeping maintains the villa and is off Sundays and holidays. La Case Créole’s location is mere minutes from two of the island’s most beautiful beaches, St. Jean and Saline. Despite its convenience, the villa still feels like a relaxing retreat. Bedroom 5: Master - Lower Level - Has a small connecting bedroom which can be used as a child room. pool size 19.7 ft. x 13.1 ft. It is a 4-5 minute car ride to St. Jean Beach. Upon arrival guests will be met at the airport by a member of the villa management team. After securing their rental vehicle guests will follow them back to the villa.